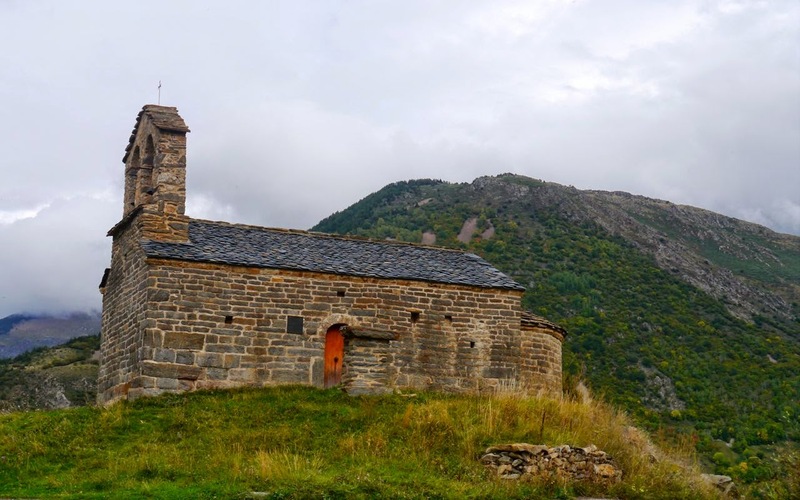 The GR11-20 from El Pont de Suert to Boí is an amazing stretch of walking and if the weather is good (and the route needs (deserves) good weather) could be a classic. Essentially it's a contour walk and spend hours crosses moors that run high on the side of a valley. 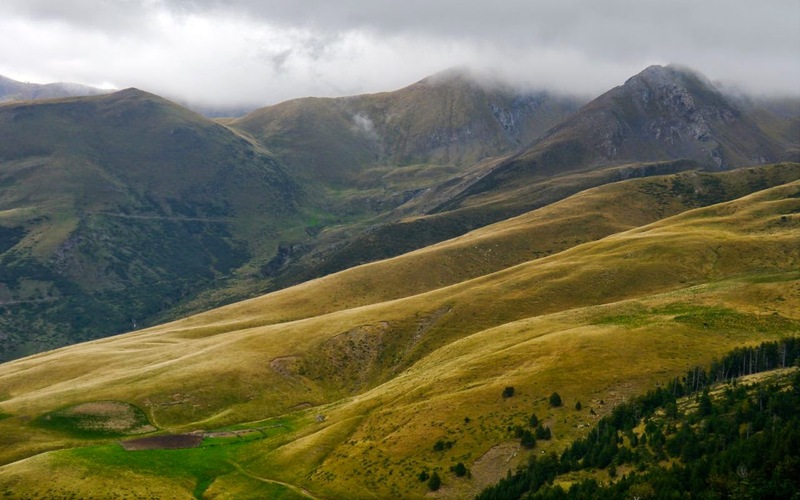 Although the immediate scenery is wonderful, especially in October when mellow autumn colours dominate, it's the views to the west that really grab the attention, particularly Monte Malditos (‘damned mountain’) and its highest peak the Pico Aneto (3404m). Great views like this however, don't come cheap and working your way up the contour walk involves a climb of over 1,000m. It was fine but cloudy when I did it, but bad weather should be avoided. 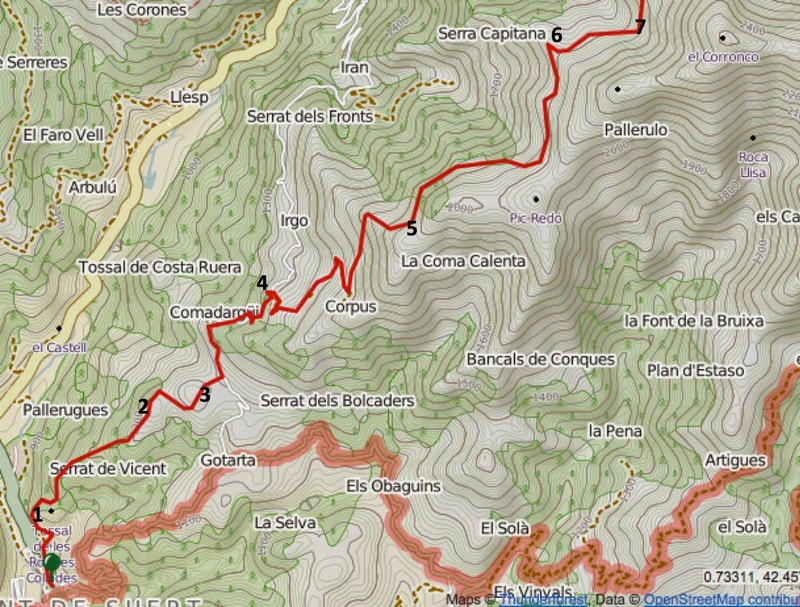 It's an exposed route, stays up around at 2000m for several hours, and the path is hard to follow without GPS. If 27km, 1700m of climb and 8-30mins of walking stretches 'the envelop' a bit too much than the walk can be shortened. 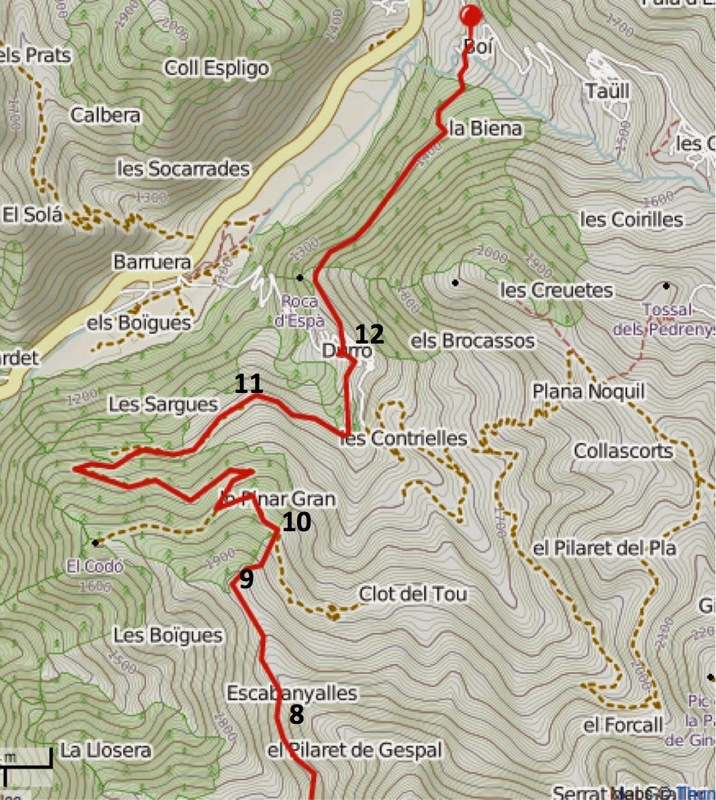 Options include getting a lift up to the Ermita de San Salvador (see 4 on the map) which saves about 90mins and gets rid of a lot climb, or stopping at Durra (12) instead of Boí (saving about an hour). Durra has accommodation but the choice is not nearly as good as it is in Boí. 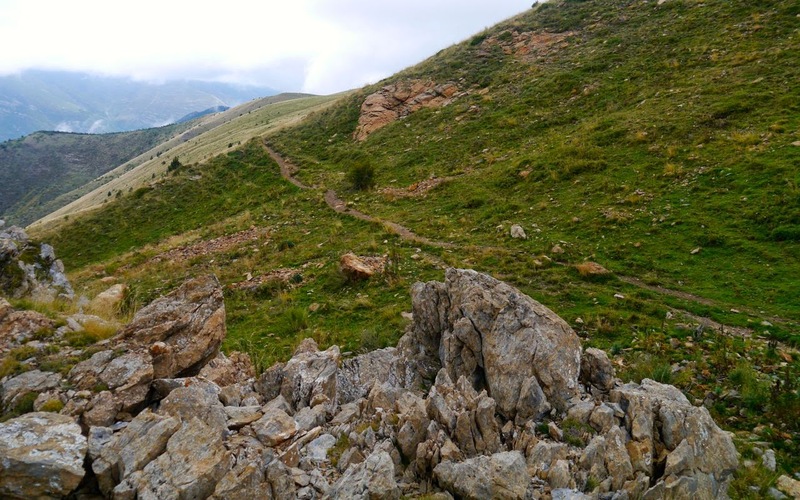 To find the start of the walk and the GR11, we head along the main road to a sign on the northern edge of El Pont de Suert (the first part of walk repeats the last part of the No 1 Circular). After swinging around the edge of a field, passing through a small holding with goats and chickens (1), the path climbs steeply NE and into a forest of old pine trees. Leaving the forest the route crosses a gully (2) and the way marks are hard to follow until we have climbed up its other side. Our path then swings south around a small hill before turning NE across over some ancient terraces (3) We then drop down onto a farm track, turn east and follow the track a short distance up a hill to a road. 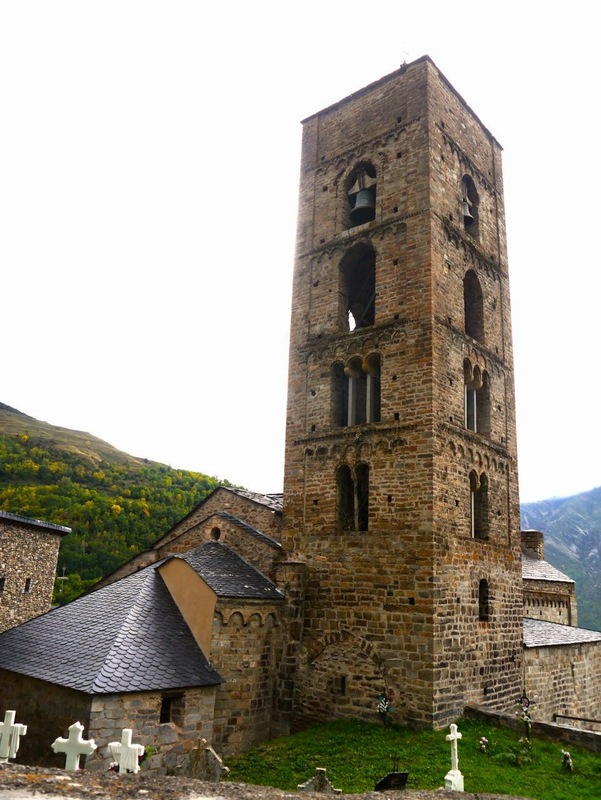 We turn left at the junction with the road and stay on it for 2.5 km all the way to the Ermita de San Salvador (4) - a lovely Romanesque chapel which enjoys great views. We then join a track across the road, opposite the chapel, and follow it as it switchbacks its way up the mountain side. The track eventually turns into a path and continues north through box and juniper to a ridge. The way marks are hard to spot and the path clearly has more bovine than human traffic. From the ridge the route is a little hard to follow. Avoiding a nasty looking descent underneath a rock face I continued east and then north around the rock face, but on the other side found a path with way marks. I took the high path, but suspect that the official route was the low one (5). From the column we head NE and down to a stream, across a couple of gullies (7) and then swing NW to the highest point on the walk (2060m) (8). After walking north another 200m a marker confirms that we’re are still on the GR11 but the path down the hill is hard to spot. Without going into the trees ahead, we swing right (9) and down across a grassy hillside (aiming towards Durra at the bottom of the valley in the distance) to a track (10). Turning left onto the track and follow it switch backing down the mountain side to the Ermita de Sant Quirc de Durro (11) the first building we see which is part of the Val de Boí UNESCO designation. 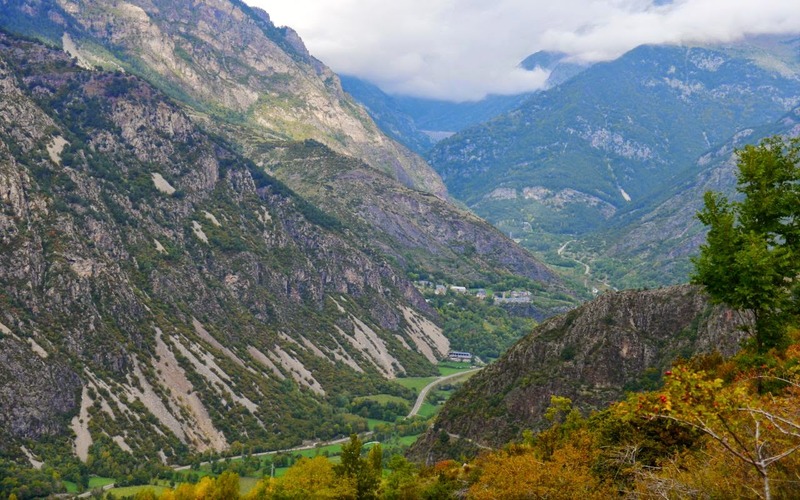 From the Ermita our route takes us east down a metalled road and across the valley to Durro. 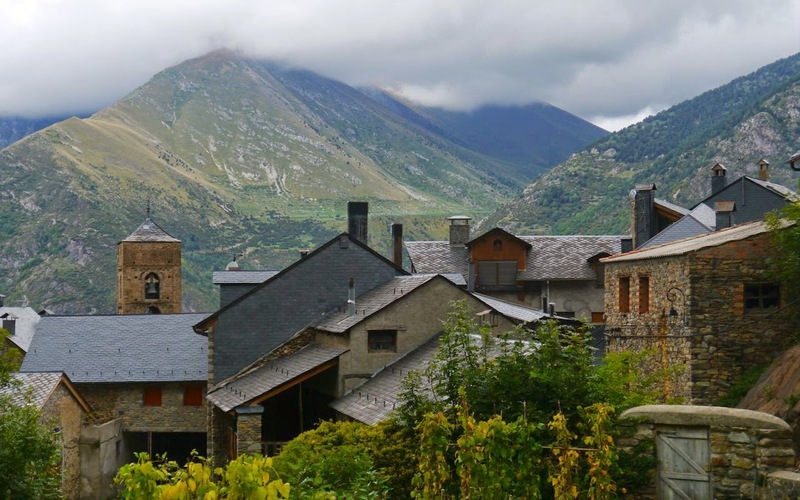 Durro (12) is the first of the famous Val de Boí villages. Without the heavily restored Romanesque church, with its tall tower silhouetted against huge green mountains, the dark grey stoned houses could a village in the Yorkshire Dales. It definitely didn't have a pub, however and even the much anticipated bar was shut when I arrived. Still Boí is that far away, just 3km, and the path that leaves Durro on its NW side, a beautiful old stone path, is a joy to follow. How is it going with the GR1 guidebook, when it might be available? I hope you have also included information for people who prefer hiking with a tent, like myself. Hi Antti, nice to hear from you. The guide is in production which takes an age. It might be a bit light on camping info as I'm not much of a camper. Still time though, what sort of info do you need? Nothing special I would say, just that I find it very useful and comforting if the guide has mentioned when there's a campsite along the way, any shelter that is good to camp next to it, if some refuge owner is happy to have campers as well etc. 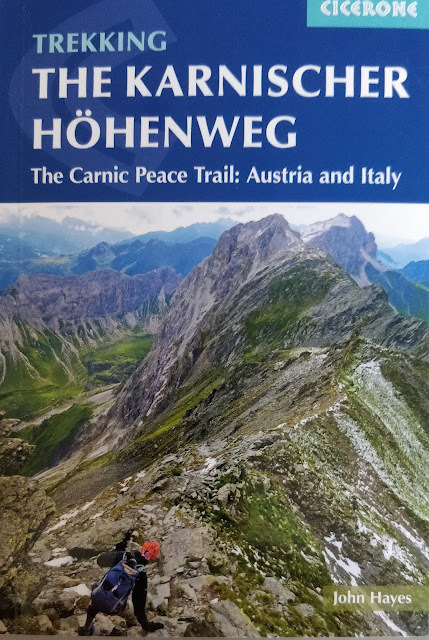 In the general information part I recommend to tell a bit how easy/difficult it is to camp in that country and on that trail especially, how are the rules and so. I believe there are plenty of campers like me, who always feel a bit nervous where to find a good spot for the next night, so any info to help this would be much appreciated.